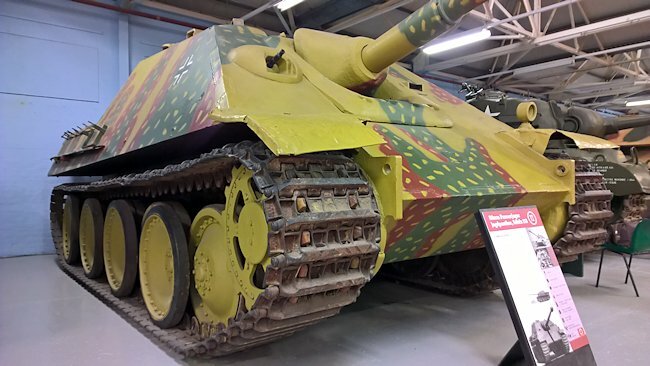 This German WW2 Jagdpanzer V Jagdpanther Tank Destroyer can be found at the Tank Museum Bovington, England. It was built under British Army supervision in Germany after WW2 had finished. 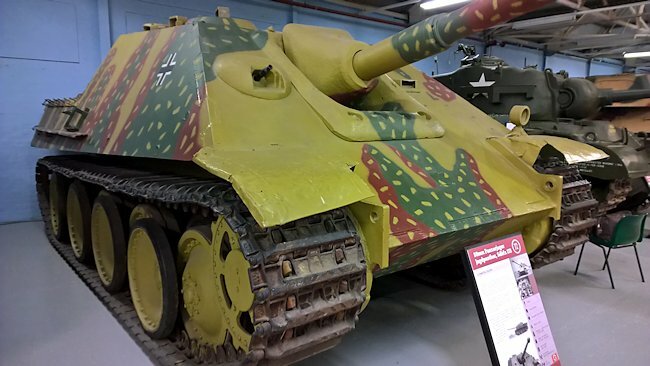 This German Jagdpanther 88mm Tank Destroyer is on show at the Tank Museum, Linsay Road, Bovington, Dorset. The nearest train station is Wool Railway Station. You can walk the 2 miles to the Museum but there are not pavements along the country road and if you are travelling with children it can be dangerous. It takes 45 minutes by foot. There is an irregular bus service from Wool Station that will get you to the museum but they only come once an hour in the morning starting after 9.30. The German WW2 Jagdpanther 88mm Tank Destroyer was based on the Panzer V Panther tank chassis. It was armed with a 8.8 cm Pak 43/3 or 43/4 L/71 gun and one hull mounted 7.92 mm Maschinengewehr MG-34 machine gun. Fifty seven rounds of 88mm shells coupd be carried along with over 600 7.96mm bullets for the machine gun. The five man crew were protected by 80mm of sloping armour at the front which was 100mm thick at the mantlet. The sides were 60mm thick and the rear armour was 40mm thick. It was powered by a Maybach HL230 P30 (V-12 petrol/gasoline)700 PS (690 hp, 515 kW). It weighted 51 tonnes and had a top road speed of 47 km/h (29 mph). It had an operational range of around 160 km (99 miles). It was produced between 1944-45 and 415 were produced. This Jagdpanther has a fahrgestell number of 303101. The factory in which it was being produced had been overrun by the Allies. It was completed under supervision of the British by the German workers who had been employed by the Maschinenfabrik Niedersachen Hanover (MNH) factory at the time of its capture. The new British management consisted of Capt W.J. Hadlow and a NCO of the Royal Electrical and Mechanical Engineers (REME). Hadlow deferred his discharge to complete the work. All the completion work was done by MNH skilled workers but it was not done at the Maschinenfabrik Niedersachen Hanover (MNH) factory. Production was moved to the gun factory at Laatzen south of Hanover as the MNH factory had being heavily damaged by late war bombing and did not have a roof. The gun Factory did have a roof. It took a lot of effort to shift the heavy machines, jigs and gun lathes. Captain W.J. Hadlow REME instructed the completion of 9 Panthers and 12 Jagdpanthers. Some chassis were completed without guns. They were used for 'hard-target' live firing practice on military ranges. 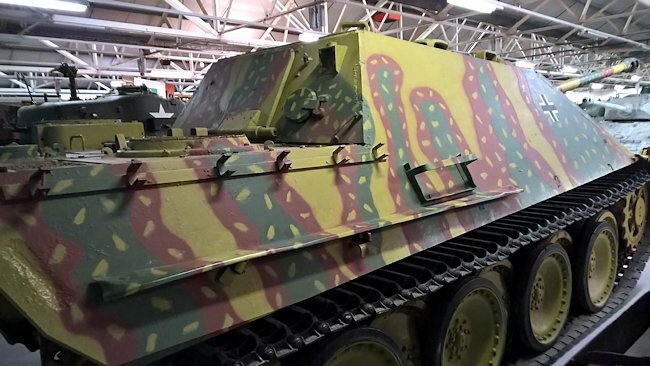 One of the REME postwar Jagdpanthers fitted with a 88mm gun was restored to a working condition and is now run by the Wealdland Foundation in Kent, England. In May 1945 German industry was running out of everything including paint. It would have left the factory just in red primer. This Jagdpanther never saw action. It was used for tests back in England. 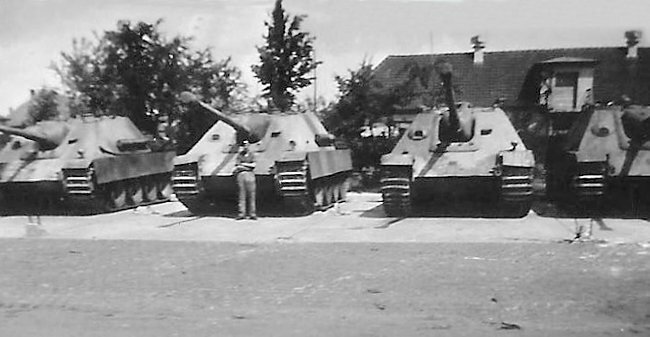 There is a 1946 black and white photograph of four of the Jagdanthers at Bergen Hohne before they were shipped to the UK. They appear to have been painted in a two tone livery. 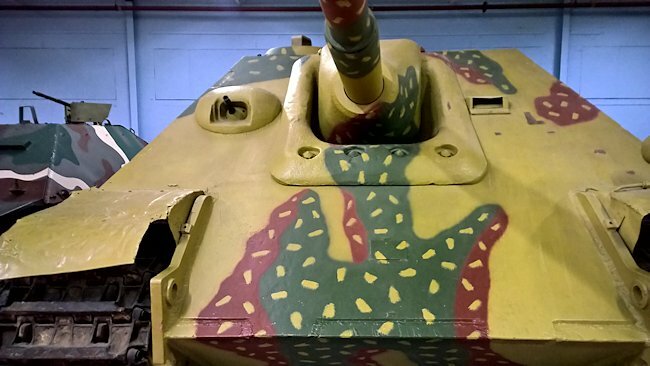 The WW2 camouflage pattern you see on the vehicle today was painted on by the staff at the Bovington Tank Museum. Sandy yellow paint called dunkelgelb was used in German factories as a base paint colour. Green and brown paint was added afterwards when the vehicles were delivered to their units. This 'sun dappled' design sometimes called 'ambush pattern' would help hide the vehicle when parked under trees in a wood or orchard. The Jagdpanther, or Hunting Panther, combined the excellent design of the Panther tank with the hard hitting 88mm PAK43 gun. The theory behind such designs was to create a weapon that could lead the attack but in the event they were used mainly in a defensive role. Very few designs made such impressive use of sloped armour. It took every advantage of the well-sloped Panther tank hull and proved a difficult target for the Allies. 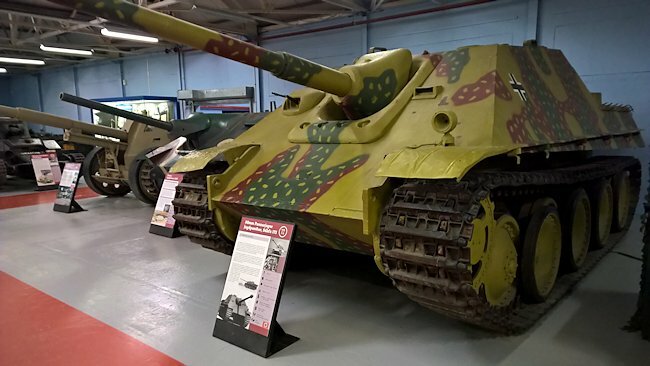 Allied troops first encountered the Jagdpanther soon after the Normandy landings and it came to be regarded as a particularly deadly opponent. The Jagdpanther was designed in 1943 but it did not enter service until the summer of 1944. Directing the gun relies to a considerable extent on the driver who has to swing the tank around in order to aim it. This subjects the transmission to far more strain than might be anticipated on a turreted tank and early trials of the self-propelled version led to a rash of final drive failures which had to be corrected. This photograph was taken in the 1960s at Bovington when the Jagdpanther was displayed outside. You can see the REME build explanation plaque on the front of the hull. This has since been changed and painted over. 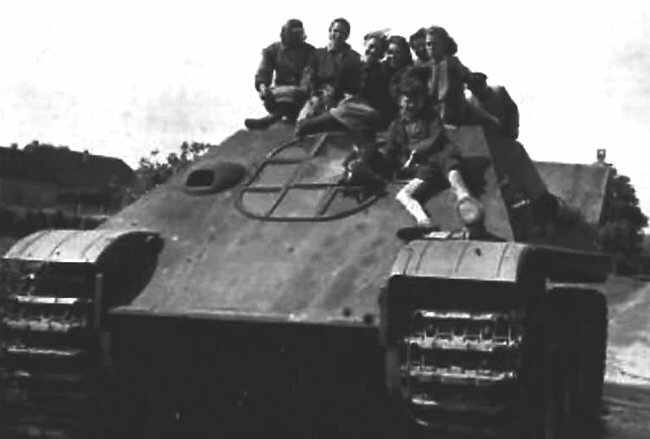 This photograph shows one of the post war REME Jagdpanthers without the 88mm gun and in its place a large metal plate. It was used as a target tug and as a 'hard' target on military firing ranges. 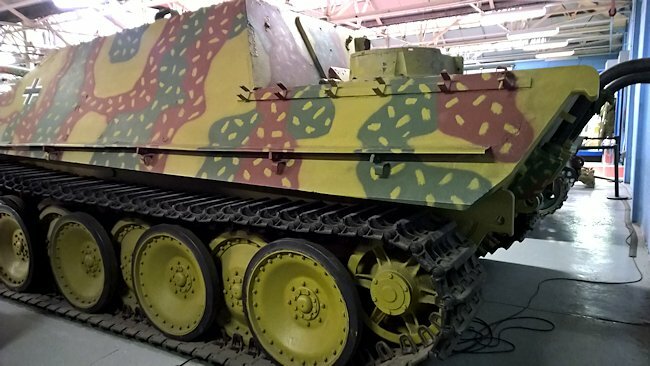 Where can I find other preserved Jagdpanthers?